An accessory for each occasion. 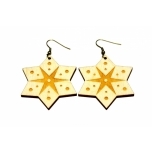 Our plywood earrings have the advantage of being lite and natural. You don´t have to be worried that your ears will be tired after a long day from wearing these beauties. You can add your own flavour and vision by colouring and decorating these earrings according to season, fashion or your mood. A perfect companion for every life occasion!